The flavor of the mango is described as a delicate blend of peach, pineapple, and apricot flavors, the perfect mixture of sweet and sour. 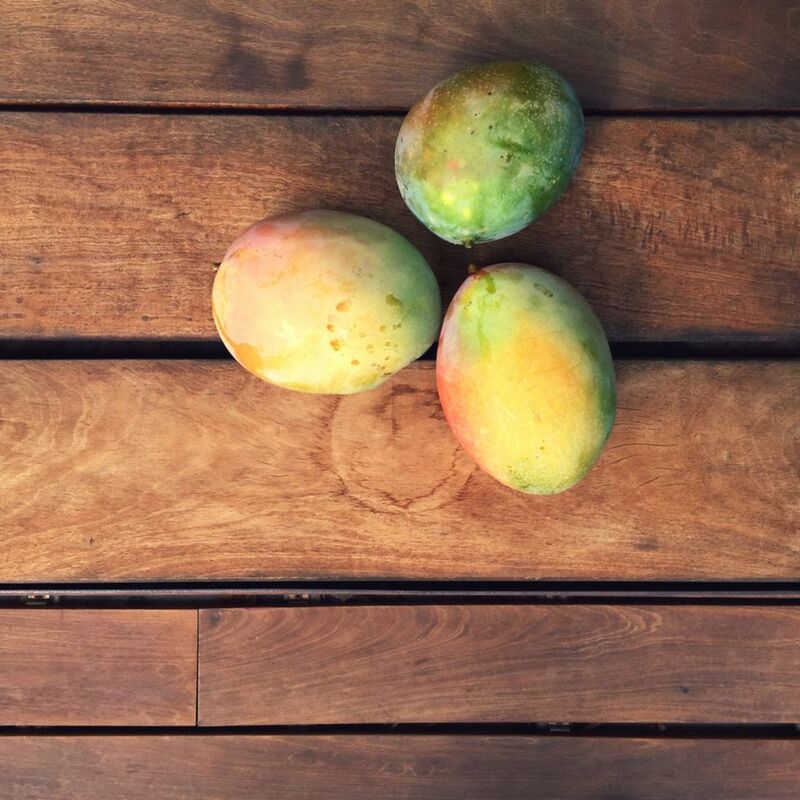 The flesh of the ripe mango has a buttery texture surrounding a large flat, inedible seed in the center. To slice the meat from the mango, you'll need to orient yourself with the large flat seed. By examining the mango, you should be able to determine its flatter sides. Slice the unpeeled mango from stem end to bottom end parallel to the flat seed on either side. You'll have two large slices with the majority of the meat. The remaining thin slice of meat surrounding the seed can then be carefully pared away from the seed. Take each large slice and cut down to, but not through, the skin in a cross-hatch pattern and then push the skin side up and out to pop the mango cubes easily from the skin. Take a look at these handy step-by-step photo instructions for a visual reference. • An average large mango will weigh about 1 pound and yield about 1 3/4 cups diced fruit. • The juice will stain your clothing, so be careful eating. • If the fruit is too ripe to delve into without making a mess, simply massage the fruit until it is extremely soft, slice off the stem end, and squeeze the juice into a glass, a container or right into your mouth. • Many markets now sell frozen mango in the freezer case. Canned mango nectar is also an option for many recipes. • If you can't find mangoes at all, but like the look of a particular recipe, you can try substituting peaches or nectarines. • Although not poisonous, the skin is generally not eaten as it can be irritating to the mouth. • If you are allergic to poison oak or poison ivy, you will probably be allergic to the skin and sap of a mango. Use gloves. In general, the peeled fruit or internal fruit juice usually causes no allergic reactions. Check with your doctor. • In many tropical countries, mangoes are peeled and sliced on an angle in a criss-cross fashion down to the seed and then served on a stick or a special mango fork, much like a popsicle or ice cream bar.